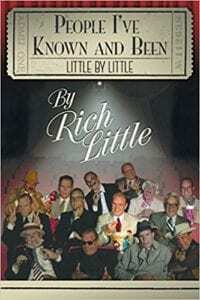 I can still vividly remember back in the 70's when our entire family would gather around the television to watch "The Rich Little Show." We never missed it and did our best to watch other shows, and movies, that Little did. His records, too, found their way into our house (I still have them) and there's a reason - Little kept us laughing.People I've Known and Been is a book that will have you laughing, and it's not to be missed for fans of both Rich Little as well as those who want an inside look into the lives of so many of our favorite movie stars. There are a treasure trove of stories in this book to get lost in, laugh along with, and reminisce about the good 'ol days. Throughout the book, Little underplays his great talent at impersonation, but those of us familiar with his career know what a talented man he is. At the back of the book is a two-page "Memories" outline that has snippets of various personalities and what they were like ("Shirley MacLaine, a bright and interesting lady. Sometimes a little off the wall, but that's what I like about her"), an epilogue that gives a further glimpse into Little's personal life, an Afterword, and a Post Script on "Can Anyone Be an Impersonator?"